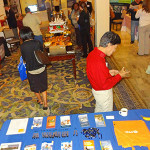 Thanks to everyone who attended the 2012 conference. You helped make it a huge success. Thriving Communities Institute and Cuyahoga County Land Reutilization Corporation believe the conference provided timely and essential information for land bank board members and staff, county and municipal officials, community and economic development officers, community development corporations and all those interested in repurposing vacant and abandoned properties and revitalizing our neighborhoods. We look forward to your participation in the third annual conference next year. We’d also like to extend a special thanks to all our sponsors.